It was not until I was an adult that the realisation came to me that most people bought their sausage from a grocery store. All of our sausages both of the Italian andPolish varieties were made by the local butcher. Every time I have this simmering it brings me back to my childhood. Oddly enough this was always a big favourite even in the heat of summer. 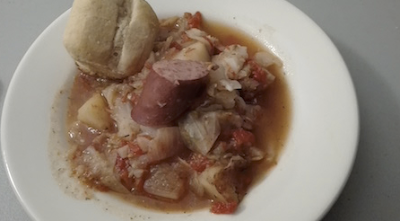 Combine kielbasa, onion, cabbage, tomatoes, potatoes, salt, pepper, caraway seeds bay leaf and water in a large sauce/stock pan. Simmer ingredients on medium low heat for 20-30 minutes or until cabbage is soft and potatoes cooked through.